providing mobility to frontline soldiers, carrying them into the battle zone, with critical armour-protection, backed with adequate fire support. The 'LAMV' (Light Armoured High Mobility Vehicle) is a recon vehicle moving ahead of the armored columns. Tata Motors Defence through the Kestrel and the LAMV provides the Indian Armed Forces, with world-class indigenously developed front line protected mobility. The Kestrel, designed and developed indigenously with DRDO, for optimised survivability, all-terrain performance and increased lethality. The occupant capacity of the hull is 12 members. The driver in combat mode has visibility through 3 periscopes and a display catching vision through front and rear view cameras, with day and night vision. The back to back seating layout allows firing through the 3 gun ports on each side, with two big hatches for patrolling. The fuel tanks are placed outside the crew compartment for additional safety. The 8x8 independently suspended vehicle has high power-to-weight ratio for mountain terrains. The vehicle can accommodate different variety of weapon stations and turrets as the application demands. The LAMV is developed indigenously with technical inputs from Supacat of the UK, for vital reconnaissance mobility, protection and firepower. A light patrol vehicle, the LAMV combines an integrated blast and ballistic protection system, including a protected all composite detachable crew pod and V-shaped hull, providing an all-round protection. Carrying a crew of six (two+four) and using the latest composite and ceramic armour systems, the crew pod is constructed as a separate module, sealed off from potential secondary projectiles. All seats are mine-blast protected. The LAMV has exceptional all-terrain high mobility performance, high power-to-weight ratio, automatic transmission, all-wheel independent suspension and can reach speeds of upto 105 kmph. The vehicle is also loaded with modern equipment for observation, surveillance and communication, configured to also address urban warfare, engaging threat on all terrains. 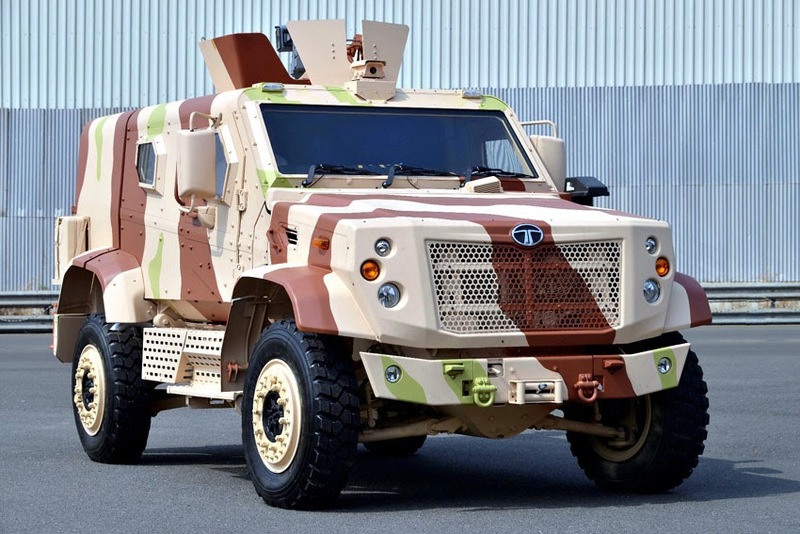 "Tata Motors has been associated with the country's defence and security forces for over 60 years, supplying a range of world-class, high technology and reliable off-road mobility solutions. While focusing on the modernisation and system upgrades of the country's mobility platforms, we have strategically moved from being a logistics support provider to a frontline combat vehicle player. The two vehicles showcased today are state-of-the-art, targeted at giving our forces the much needed capabilities of strategic mobility for rapid offensive thrusts into enemy territory. Developed with DRDO, the Kestrel is based on modern modular designs, which can incorporate imperative upgrades, thereby enabling them to retain functional superiority throughout their service life," said Ravi Pisharody, Executive Director, Commercial Vehicle Business Unit, Tata Motors Ltd.
Tata 7.5 T MRV on LPTA 1623 4x4 BSIII: Tata Motors showcased a 7.5-tonne, hydraulic Medium Recovery Vehicle (MRV) on the LPTA 1623 4x4 BSIII platform. Developed indigenously by Tata Motors along with PLS Limited, the MRV is the first of its kind OEM manufactured vehicle, enabling ease of operation and readiness at all times. The Tata 7.5 T MRV enables speedy recovery and repair of vehicles in the 7-10 class, and gets them on road in time to ensure smooth sustenance to the operational tasks in hand. The Tata 7.5 T MRV caters to operational requirements such as extrication of vehicles, suspended tow unditiching/uprighting of vehicles, loading/unloading of various categories of load, etc. Tata Armoured Personnel Carrier (APC) Left-Hand Drive (LHD): The Tata APC - LHD, has been developed specifically for LHD markets to protect security forces from threats like ambushes, sudden violent attacks and powerful explosive mines. Tata APC takes troop protection to the next level. Designed to protect against gunfire, with ballistic protection of NIJ Level III, it provides essential protection to military and para military forces. It is well protected against under wheel/underbelly blasts and has more than acceptable levels of mobility.